A highlight of my year is always the Festival Montréal Baroque - a four day early music festival full of magnificent works, humour, new discoveries, friendship and surprises. 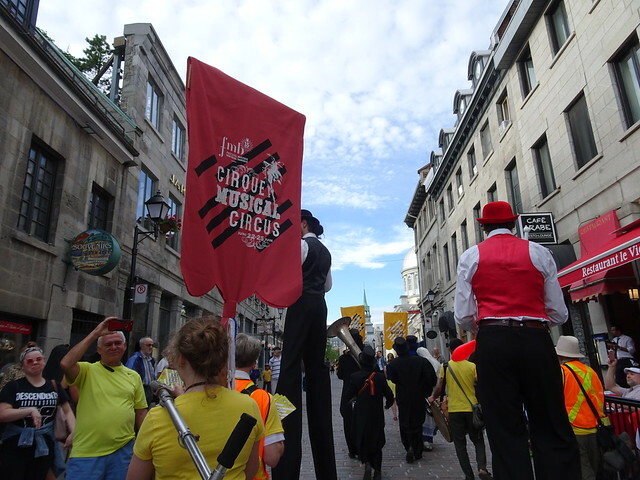 This year's theme was the circus and it started with sheer delight - a parade through part of Old Montreal to the venue of the first concert: Chapelle Notre-Dame-de-Bonsecours. 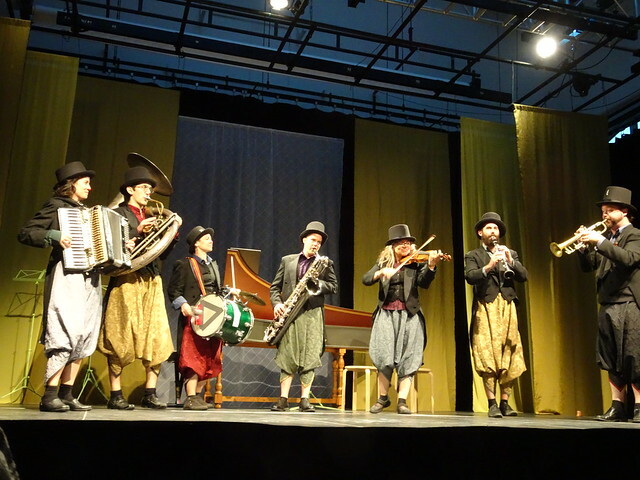 It was led by La Carmagnole, a circus band playing mainly Klezmer music and dressed as ravens. 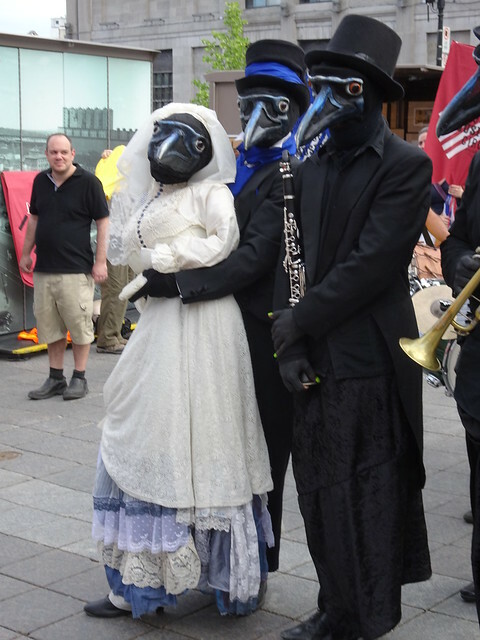 A raven "couple" danced along while two stilt walkers juggled and danced with people in the crowd. It was extraordinary to watch the ravens dance - the female raven was a puppet, but behaved perfectly raven-like. This raucous band was followed by a more serious concert: Monteverdi's Vespers led by Matthias Maute, one of the co-directors of the festival. Absolutely splendid. Susie Napper, the founder of the festival has to be one of the most creative programmers. 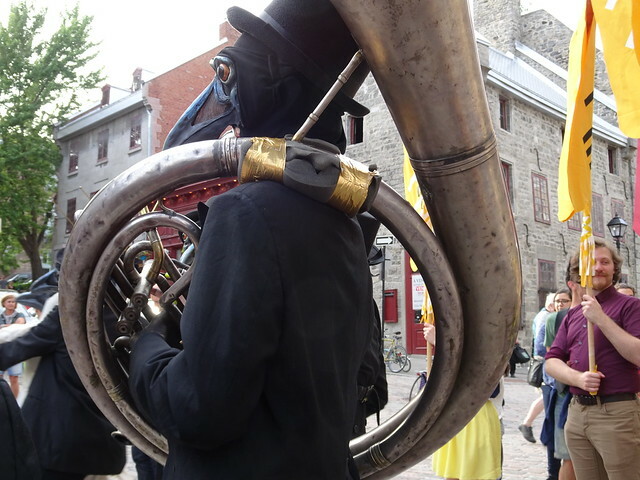 Relying heavily on local talent (Montreal has a large number of early music groups and performers) with a few people from outside she (and now along with Matthias) puts together an incredible array of concerts - about 15 over the course of the four days. There are also outdoor concerts, lectures, an exhibit area for instrument makers and other music related vendors... In addition she arranges with a local cafe to host the young musicians who play while festival performers and attendees can enjoy a bite to eat or a refreshing drink. 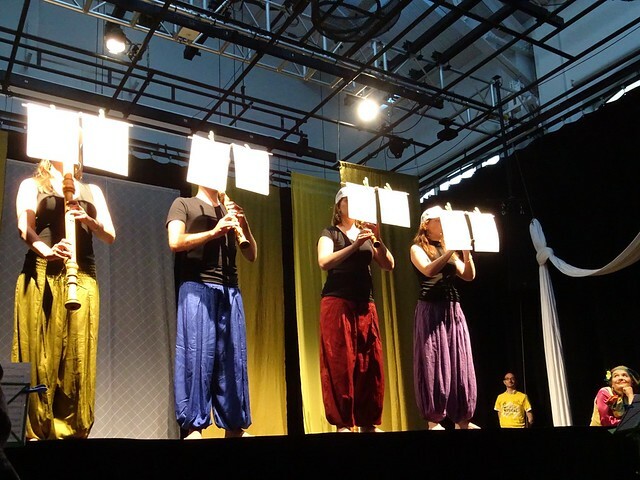 One concert featured some of the younger groups each along with a circus performer. All was choreographed - good music but also great fun and quite a spectacle as acrobats, a woman on silks, a man on a loose wire, a clown, each in turn amazed the audience. 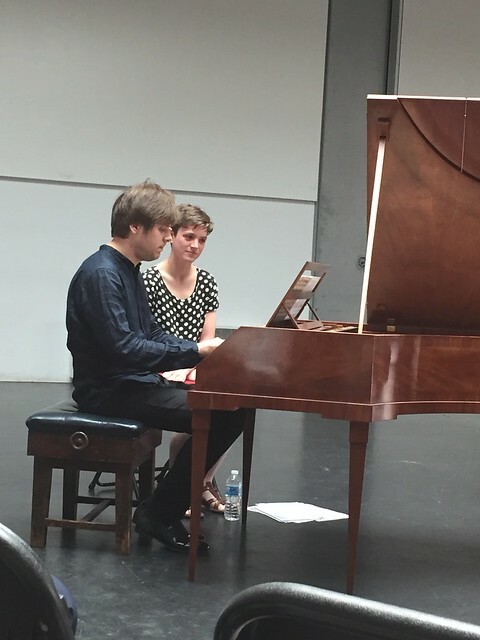 This concert was dedicated to the memory of Nicolas Fortin, who died far too young. He had been the director of operations. In addition to great music, it is always interesting to see the venues Susie discovers for the concerts. This year concerts were held in the Chapelle Notre-Dame-de-Bonsecours, the crypt of the church, a couple of halls at UQAM (Université de Québec à Montréal), the Church of St. John the Evangelist, Musée d'art contemporain and at Notman House (former home of the Montreal photographer, William Notman). 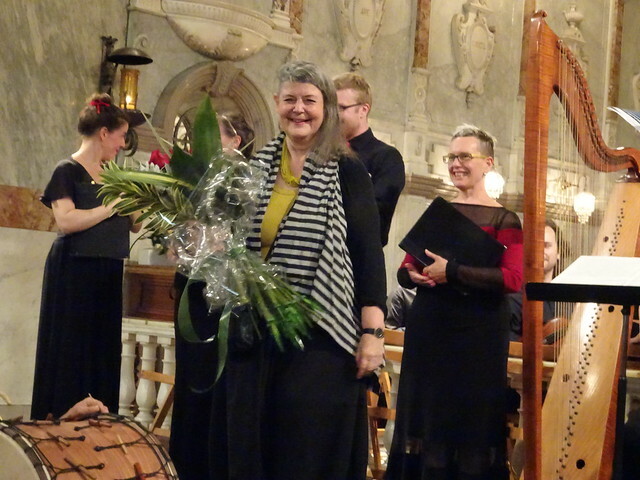 This year included a keyboard festival - three concerts dedicated to early keyboard - harpsichord, clavichord and fortepiano. I heard this young musician who is studying in Amsterdam both in solo performance on clavichord and fortepiano and with his "page turner" who is actually a cellist. 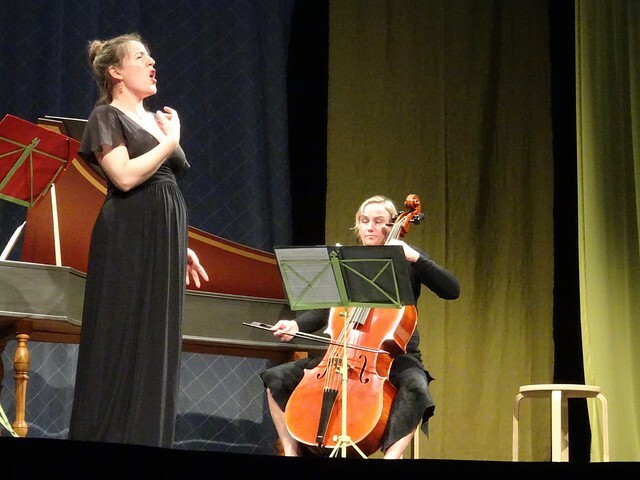 From a moving concert by Red Owl to an opera that Bach might have written had he followed the route of Handel instead of being a church composer, the festival touches on every human emotion and always ends with a sense of joy. Thank you, as always, Susie - and also to Matthias for a memorable few days. I see you're enjoying a summer of music, Susan. Are you going to camp? Thank you for the great pictures Susan! I was glad to be able to attend the Circus and young musician concert. It was really fun, with wonderful music. Susie and Matthias, a thousand thanks! Dear Susan - I think I know how you loved and enjoyed this music festival. The raven-band is so unique and fun but I wonder if the raven-people didn’t feel hot with that attire marching outside.